The standard denture rests on the gum tissue and moves as the patient chews food. Patients often get food beneath the denture, which irritates patients. The standard denture should be remade every 5 years as the underlying bone that supports the denture shrinks gradually and continuously throughout life once the teeth are lost. Then the denture becomes less stable and bothers the patient more and more as the patient chews food. The bar attachment denture provides improved stability for a denture because the denture has attachments that secure the denture to the bar. The bone around the implants does not typically shrink much and even if it should the clips hold the denture in a stable position over time. The bar is best supported by two to four implants. The attachments that secure the denture may wear and may have to be replaced. Occasionally the patient may need to remake the denture if the teeth wear or if the denture should break. However the underlying bar is not typically remade and can be used again with a new denture should a new denture have to be fabricated. Often a temporary denture can be attached to the implants on the day the implants are placed. With the temporary denture the patient has to initially restrict their diet to foods that be cut up with a plastic fork for several months until the implants have healed well. Once the implants have healed the restorative dentist will make the final bar and final denture and the patient can eat freely. The beauty of the bar attachment denture is that as long as the implants remain healthy, the implant and bar are a long lasting solution to the problems of a completely stable denture. The bar is typically not remade but the denture will probably have to be remade occasionally. The ball attachment denture typically involves use of two or three implants, upon which are attached a ball abutment once the implants have healed. The denture has a socket type attachment that can fit over the ball abutment to help stabilize the denture. The ball attachment denture is not as stable as the bar attachment denture. In general, as you increase the number of implants from 2 to 4, the replacement teeth stability markedly increases. 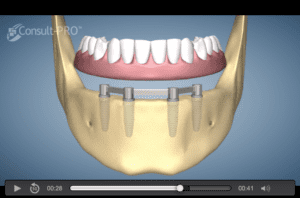 Which patients are the best to have a bar attachment or ball attachment denture? This type of treatment works best if the patient has limited dexterity in cleaning around the implants as the patient can remove the denture to clean the bar and about the implants. The bar attachment denture works best for patients that have moderate jawbone shrinkage. The ball attachment denture works best for patients who have minimal jaw shrinkage with a good volume of bone to support and stabilize the denture. In general, the more severe the bone loss, the better the patients are to have a fixed prosthesis such as the All-on-Four.